Rhiannon won a Yorkshire-wide schools competition last year, organised by Leeds-based QAD Architects and Brighouse-based metalworking specialists Arkoni, to celebrate the Tour de France's Grand Depart in the region. Rhiannon explained: "I love animals and thought that a snake would be a good idea for a bike stand. I was very happy when I found out I'd won and can't believe that the snake has now been brought to life outside of my school!" Manufactured from galvanised mild steel, the green and black snake stretches for 7.5 metres with a capacity for 10 bicycles in total. Paul Wainwright of QAD Architects explained: "Initially we wanted to celebrate the Grand Depart coming to Yorkshire and this year's inaugural Tour de Yorkshire but we also wanted to encourage the designers of the future by organising a competition that drew on the practical and imaginative design skills of pupils. "Rhiannon's design was chosen from over 100 entries from across Yorkshire and we set the wheels in motion with Arkoni to manufacture and install the new stand at her school. 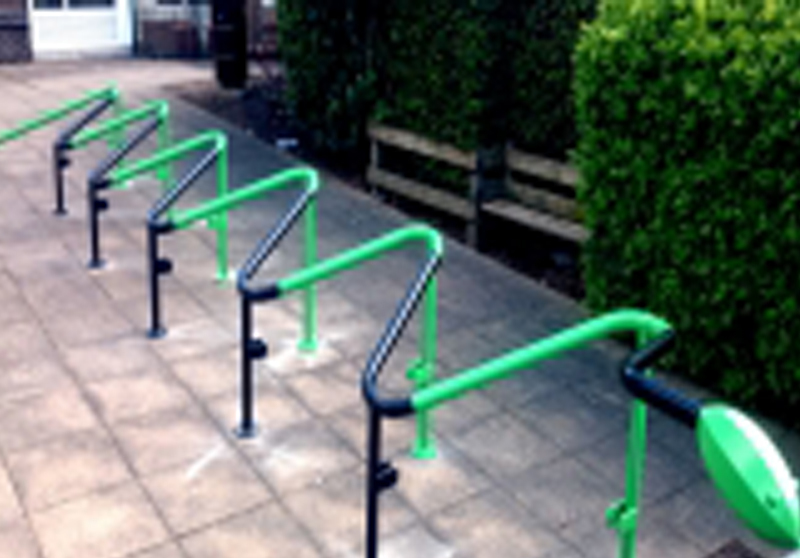 "The end result is a very eye catching feature that helps to define the school's main entrance as well as being a practical bike stand that encourages cycling," added Paul. Arkoni set a team of apprentices on the challenge of designing up Rhiannon's drawing and manufacturing it into shape at their workshops. One of those chosen was 17-year-old James Horner, currently in his first year of a four year Skilled Fabricator and Welder apprenticeship programme with Arkoni. "I was confused at first when I found out about the project. It's a real change from what I normally do preparing fire-rated glazing and I didn't think I could do it but the support of fellow apprentices Elliot Knight and Elliott Ashmore has proved very helpful. "Like Rhiannon, we're delighted with the outcome," added James. Fellow Mechanical Engineering apprentice Elliot Knight, 22 and approaching the end of his draughtsman apprenticeship, was similarly energised by the challenge. "To a degree, Rhiannon's drawing was open to interpretation so we looked online at similar creative bike stands for inspiration. We then set to work designing the snake in liaison with QAD and Rhiannon and, soon after, it was forged into shape by Elliott and James. "It's been a lovely project to have been involved with and a big learning curve, in the shape of a snake, for all of us!" added Elliot.